There's nothing quite warmer or softer than fleece, and that's why I was taken aback at how comfy the new scarves from Admiral Road were! We were able to try out a few different sizes (they come in Kids and Big Kids) and the fashions were so fun! 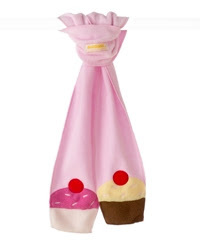 The Cupcake Scarf - This sweet scarf was perfect for a little girl, and featured a yummy pink color, accented with cherry-topped cupcakes! Sized 6" x 50" -- it's designed for ages 3 and up. 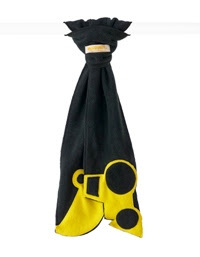 Digger Scarf - Who wouldn't love this rough and tough scarf, featuring a front-end loader and striking black and yellow colors? Boys will really "dig" how warm this is! Sized 6" x 50" -- it's designed for ages 3 and up. You can see the entire inventory of scarves at the Admiral Road website. They start at $12! Wanna Win? We are giving away a Kids' Space Scarf and Big Kid's Cherry Scarf to one lucky newsletter subscriber! Just be sure you're signed up via our link on the right-hand side of our website! We'll pick a winner at the end of the month and let you know via email! I like the cupcakes and flowers scarves.